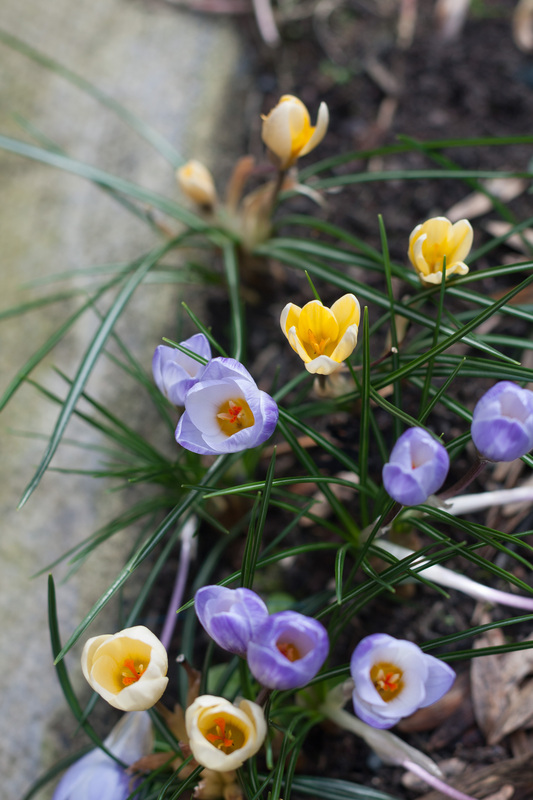 I spoke too soon about the crocuses! Last week they finally came out and I was so delighted. They are much more delicate than the boisterous crocuses on the Meadows, but I put that down to this being their first year, having been stuck in by an overenthusiastic amateur at possibly the wrong depth. Once they have had time to properly settle into the soil they should start to flourish and do better year after year. This delicate look is rather pretty actually, but they could do with being a little stronger and less like fainting come the merest breeze. In my last post I mentioned how keen I was to invite bees to the garden, and last Saturday I went to Homebase with The Brazilian in tow to pick up some seeds for flowers attractive to bees. The Brazilian didn’t come voluntarily; we were on our way from somewhere to somewhere else, and Homebase just happened to be en route. Otherwise I would probably have chosen to go to an independent garden centre because choice and quality in Homebase can be quite limited. Having said that, having limited choices is ideal for speedy shopping, especially if you have a bored non-gardener tugging at your sleeve. ‘Can we GO now,’ said The Brazilian about fifteen seconds after we’d walked in to the store. A minute later he came back with some sort of ultra-hot weed killing blow torch thing. ‘This is the only interesting thing in this shop,’ he said. ‘Can I buy it?’ ‘Sure,’ I said. He mooched away and put the ultra-hot weed-killing blow torch back on the shelf, then came back. 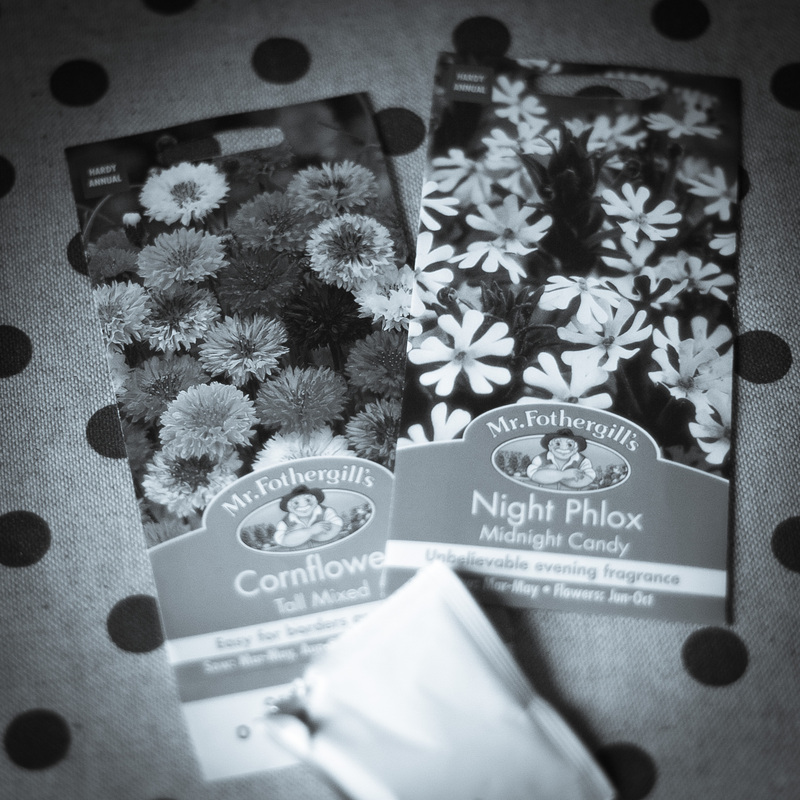 ‘Can we GO NOW?’ Under this duress I selected two types of seed, cornflowers and night phlox, both of which promised on the packet to be nice for bees and other insects. I initially thought I’d come home with more than two types/packets of seeds, but in the store I had a quick rethink as we don’t have that much space, just two medium-sized ceramic planters and no bed space to speak of. Secondly, I am using these seeds more as a cautious experiment as I have never grown flowers from seed before, so two packets seemed enough to be interesting but not so much as to be overenthusiastic. Also, I had to choose seeds that could be sown where they are to flower, as I have not yet organised a way of propagating seedlings indoors. These two, the cornflower and night phlox, fitted these requirements, as well as fulfilling more basic ideals of being calmly pretty as I’m not a fan of the more unnatural-looking overbred flowers of implausible colour, plus the night phlox promises to produce a beautiful scent in the evenings which will be gorgeous when it’s warm enough to sit out in the back garden. Once home, I dragged the unused ceramic pot out from its hiding place behind the tool shed in the front garden, which was going to become a home for the seeds. 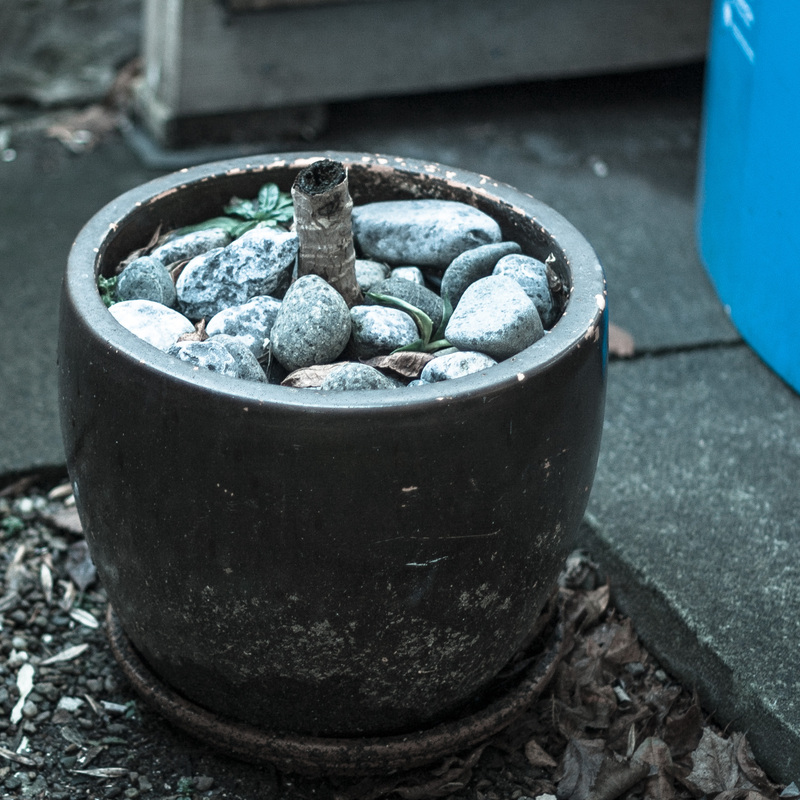 This pot, about a foot in diameter, once contained a small tree of some kind that had died and been cut back to just a short stub of trunk sticking out above its ornamental pebbles. It had clearly been dead for a very long time. I removed the pebbles one by one, revealing some anaemic and startled wormy things. The stump looked as though it would come out quite easily, so I grasped it confidently and tugged. That was a mistake. The damned thing exploded in my hand, spraying out a toxic and evil-smelling red liquor. I went inside and washed my hands, then proceeded more cautiously with a small fork to dig out the root bole. The soil itself was of unexpectedly good quality, fresh and nice feeling, quite rich. I don’t know much about soil and compost, but somehow without any formal teaching or experience you can easily tell the difference between poor, indifferent soil that won’t hold much water, and rich, fertile soil that will be moist and life-giving. I made sure no obvious root parts remained, and turned all the soil over with the fork before patting it down. Now for the sowing. I made sure I read the instructions on the back of both packets; there didn’t seem much to it. Water the soil first, which I did, then sprinkle on the seeds (I used about half the seeds from both packets) and cover them with half a centimetre of soil. Keep the whole thing moist, and in two to four weeks (four, I’m guessing in Edinburgh, given that it’s still below zero some nights and not much more than six or eight degrees during the day) the seedlings should start to appear. 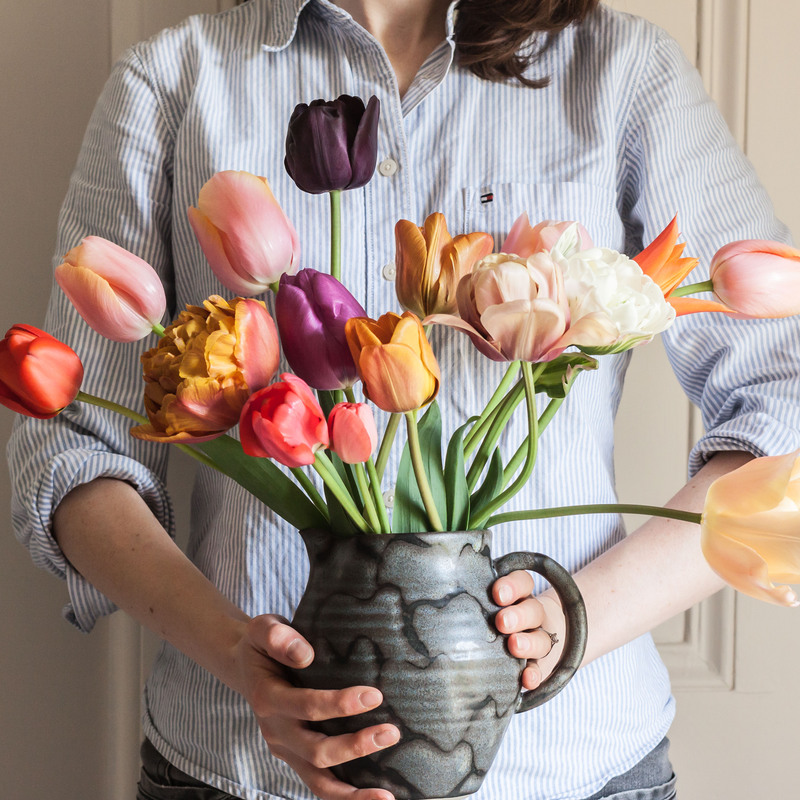 Then I did the same thing with the unused ceramic planter in the back garden. I was more cautious digging out the soil in this one, because it had clearly recently had something growing in it that was now just brown stalks, but might have been something that would come back. However, there was almost no root structure, and no bulbs, hidden below the surface so I took a chance and cleared the pot out completely, then refilled it with soil and planted the seeds, leaving it in a spot that gets quite a bit of sun. Hopefully the nice couple who are our landlords won’t read this and yell that I’ve dug up and killed their priceless perennial whatsit.